Being the organizer/sponsor of events for my company I’m really happy – where possible – to include my personal interests. In the past, organizing events including electric cars was a tedious or even impossible task. Now, the time is – finally – ripe! 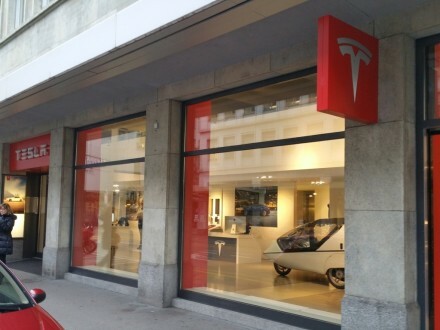 Currently, no other EV-brand has both the coolness and media exposure as Tesla – After just a few calls everything was ready to host the event at Tesla’s Zurich store. This time my company facilitated an IT-security event on game-changing security technology together with our local telco, Swisscom and a well-known IT-security vendor for C-suite decision makers of Swiss companies at Tesla’s Zurich store. The event was a success and the store with a Model S chassis on display and luxuriously designed interior added to the exclusivity of the event. Quite dramatic with Model S’ chassis taking center stage! Perfect parking spot…or so I thought! …and attracted the interest of a police-woman who was just about to write me a parking ticket. I went outside and spent some time learning about federal and local Zurich parking regulations (This information alone merits a blog-entry on its own!) whilst applying copious amounts of charm to avoid a 40 CHF parking ticket. At the end of our friendly dialogue, she agreed to waive my ticket but asked me to move TW560 somewhere else. 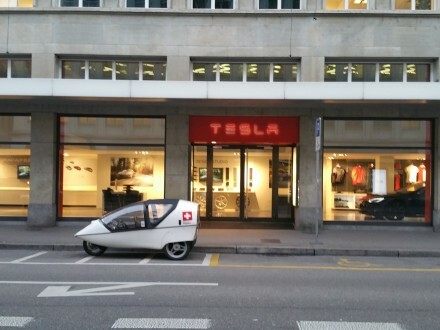 Not wanting to head out in search of a parking spot in notoriously clogged Zurich, I decided to ask the guys at Tesla if i could just park my TWIKE on the showroom floor. It would be fun, everybody agreed. 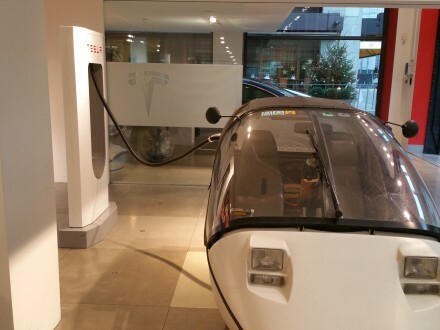 With this settled, I drove my TWIKE inside and I was impressed how well it fitted the environment! TWIKE’s should have had this kind of presentation 20 years ago. Wouldn’t it be grand? Charge 20Ah in 5mins! See the video below. 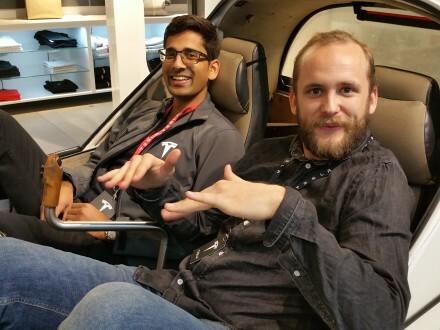 It shows the store, how Tesla’s staff tries out TW560 and Tesla’s crew explaining TW560’s features to a colleague: True sales people! After the drive: a typical EV grin! With the event drawing to an end, I was happy to see that a few customers had expressed real interest in taking the decision process forward -> towards electric mobility and the purchase of a Tesla. Who thought 10 years ago that we would be at this stage already? Thanks to Tesla we are! Truly disruptive technology and marketing power! A bright future, indeed!